McAfee VirusScan is an antivirus program created and maintained by Intel Security (formerly known as McAfee, Inc., and Network Associates prior to that). McAfee VirusScan is intended for home and home-office users; McAfee VirusScan Enterprise is intended for corporate environments. It is not available as a standalone package, but is included in McAfee VirusScan Plus (for Windows), VirusScan for Mac, or as part of McAfee Internet Security (for Windows) or McAfee Internet Security for Mac. Additionally, BSkyB and McAfee have produced a "Sky Broadband" branded version of VirusScan, offered free to Sky Digital customers upon broadband modem installation. The 2010 edition of VirusScan Plus integrates antivirus, firewall and anti-spyware capabilities. In the upgraded release in February 2010 McAfee discontinued SystemGuards in favor of its Active protection (Artemis), which detects suspicious activity in real-time and contacts McAfee labs to determine whether the file is a threat. Artemis was released around August 2008. McAfee also produces an enterprise-level product named VirusScan Enterprise: McAfee has designed this for use on larger networks designed to make management of antivirus software on multiple computers easier. Unlike the home-user edition, the Enterprise edition consists of a client application for networked computers, and a server application, which the system installs updates and configures settings for all client programs. Clients can be controlled using the included ePolicy Orchestrator (ePO), which is a unified console that can control VirusScan and other McAfee products. Universal Binary: First universal binary version in the Virex product line. It will run on both Intel- and PowerPC-based Mac computers natively. On Access scanning: Features true blocking On Access Scanning. It scans every file being accessed from or written to the machine and blocks infections if any. On Access Scanner can be configured to scan on Read Only, Write only or both. It can also be configured to scan files on network volumes. 5301 engine support: The latest McAfee Anti-Virus engine. In tests by Virus Bulletin and other independent consumer-organizations, McAfee VirusScan has not fared well, frequently failing to detect some common viruses. A review of VirusScan 2006 by CNET criticized the product due to "pronounced performance hits in two of our three real-world performance tests" and some users reviewing the same product reported encountering technical problems. Some older versions of the VirusScan engine use all available CPU cycles. As of 2009 McAfee virus-scanning products did not handle false positives well, repeatedly removing or quarantining known clean files even after the user restores them. Reviewers have described customer support for McAfee products as lacking, with support staff slow to respond and unable to answer many questions. On April 21, 2010, beginning approximately at 2 PM GMT, an erroneous virus definition file update from McAfee affected millions of computers worldwide running Windows XP Service Pack 3. The update resulted in the removal of a Windows system file (svchost.exe) on those machines, causing machines to lose network access and, in some cases, to enter a reboot loop. McAfee rectified this by removing and replacing the faulty DAT file, version 5958, with an emergency DAT file (version 5959) and has posted a fix for the affected machines in its consumer "KnowledgeBase". 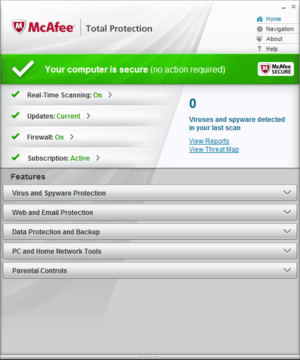 An August 2012 update to McAfee antivirus caused the protection to become turned off and users to lose internet connections. McAfee was criticized for not notifying users promptly of the issues when they learned about it. McAfee, though well-known, continues to have mixed reviews by industry sources, and the company has prepared a 2015 release series to address current market conditions. This repositioning includes voice and facial recognition authentication for cloud-based data security. ↑ "McAfee Press Release". Mcafee.com. Retrieved 2010-11-09. ↑ "McAfee, Inc. Releases VirusScan Software for Leopard". Mcafee.com. Retrieved 2010-11-09. ↑ Tedja, Irsan. "McAfee VirusScan 2006 Reviews - Cnet.com". Reviews.cnet.com. Retrieved 2010-11-09. ↑ Tedja, Irsan. "McAfee VirusScan 2006 Ratings - Cnet.com". Reviews.cnet.com. Retrieved 2010-11-09. ↑ "Computer Shopper Review". Computershopper.com. 2009-09-13. Retrieved 2010-11-09. ↑ "TopTen Reviews". Anti-virus-software-review.toptenreviews.com. Retrieved 2010-11-09. ↑ "McAfee DAT 5958 Update Issues". 21 April 2010. Retrieved 22 April 2010. ↑ "Botched McAfee update shutting down corporate XP machines worldwide". 21 April 2010. Retrieved 22 April 2010.